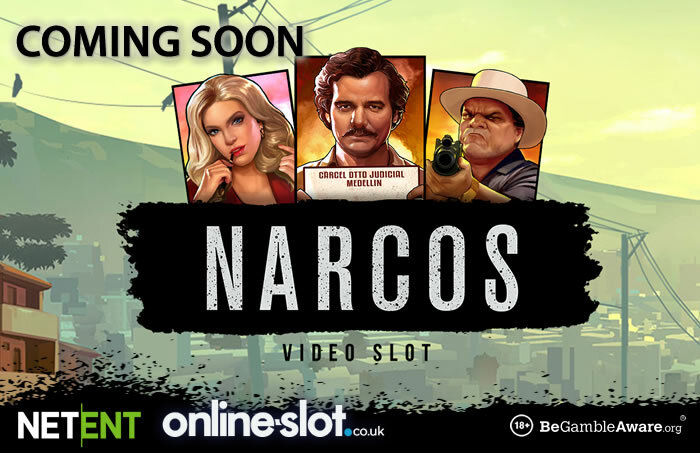 Net Entertainment will be releasing the Narcos slot on the 23rd of May (2019) – in the meantime, they’ve released a YouTube trailer to showcase all the features. Narcos will be based on the Netflix television series which chronicles the rise the of the cocaine trade in Columbia – based on the exploits of kingpin Pablo Escobar, the slot will have 5 reels and 243 ways to win. With superb graphics and animations, you’ll see DEA agents Steve Murphy and Javier Peña on the reels. When it comes to bonus features, winning wilds will trigger the Walking Wild feature where the wild moves 1 reel left with each spin as long as you keep on winning. You can also see a car pulling up behind the reels and fire shots at the symbols to transform the high value symbols into wilds. The Locked Up feature will see symbols move together and given a cash prize – with free spins to follow, you can Lock Up and Golden Locked Up symbols which give you more payouts. The latter can add multipliers up to 3x, increase the value of the symbols and increase the worth of the Golden Locked Up symbol for big cash wins. Prior to the release of the Narcos slot, I recommend you play Vikings – this is based on the television series and is also powered by Net Entertainment. Highly volatile, it offers payouts of up to 10,000 times your stake on each free spin. You can play Vikings and many other branded slots at SlotsMillion Casino – with nearly 1,800 slots to choose from, they have 24/7 customer support, same-day cashouts and a Lock Withdrawal feature where you can stop the reversal of a cashout request so you get to cashout your winnings. New players are treated to a 100% bonus up to £100 plus 100 extra spins (20 per day for 5 days).